The Government's preferred Brexit deal will "protect jobs and livelihoods" in the North East and support major manufacturers such as Nissan, Prime Minister Theresa May has said. Her Cabinet visited the region earlier to tie in with the Great Exhibition of the North in Newcastle and Gateshead. The Prime Minster also confirmed up to £780m would be invested in the East Coast Main Line from 2019. However, business leaders warned her Brexit approach could see job losses. 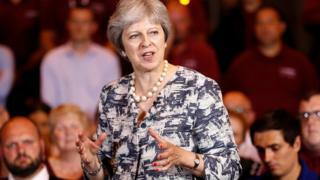 Speaking at the Reece Group factory, in Newcastle, Mrs May said the deal the Government was putting forward was about "protecting jobs and livelihoods in areas such as this". "It's about recognising the importance to companies like Nissan of the integrated supply chains with the European Union and ensuring that means frictionless movement across the border," she said. "That's what we have proposed with our free trade area and combined with the facilitated customs arrangement, so we put a plan forward that actually recognises the importance of that frictionless trade to companies exactly like Nissan." James Ramsbotham, chief executive of the North East England Chamber of Commerce, warned: "Businesses are really concerned about the complete lack of clarity as to where the negotiations are currently headed. "North East businesses certainly want to remain within the single market and the customs union." Away from Brexit, Mrs May confirmed the £600m North of Tyne Devolution deal for Newcastle, Northumberland and North Tyneside would not be resolved before Parliament's summer break. She said the investment for upgrades across the the East Coast Main Line formed part of the Government's plan to overhaul transport in the North. When questioned about recent difficulties encountered by Northern Rail passengers, she said: "Yes, there have been problems and people deserve a better service. "The service that they received with the new timetable was unacceptable." Chi Onwurah, Labour MP for Newcastle Central, said Government funding for transport in the North was a "tiny proportion of the per head funding in London", and added that the £780m for the East Coast Main Line had previously been announced.